Some decks just simply gain a ridiculous amount of life and hide behind it. Whether their life total becomes completely out of reach or simply a major annoyance at ending the game anytime soon, there are many ways to handle life gain. Some decks just don't have enough firepower or threats that are massive enough. Find more efficient or heftier finishers or build with synergy in mind so that each spell has a greater effect on the game in the long run. Prevent their life gain entirely with spells that just say no: Stigma Lasher, Everlasting Torment, Leyline of Punishment, Sulfuric Vortex, Forsaken Wastes, and Flames of the Blood Hand. Punish your opponent for trying to gain life: Rain of Gore, Punishing Fire, False Cure, and Kavu Predator. 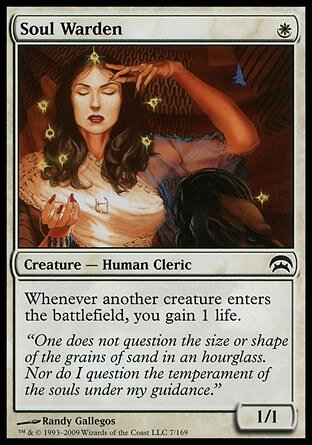 Choose their life total for them: Magister Sphinx, Sorin Markov, Repay in Kind, Biorythm, and Sway of the Stars. Play cards that grow over time. These are the kinds of cards that become more powerful as the game carries on. There are simply too many to list here so I'll just give some quick examples: Some Hydras and Oozes in Green are able to grow (ex: Primordial Hydra and Predator Ooze), the Sliths and their cousins the Red Vampires of Innistrad grow in power as they hit the opponent (ex: Falkenrath Marauders), equipment that have abilities that gain power overtime (ex: Banshee's Blade and Umezawa's Jitte), cards that store up counters that can be released for a larger effect later (ex: Shrine of Burning Rage), cards that generate tokens overtime (ex: Emeria Angel), cards with X in their costs (ex: Banefire), and cards with activated abilities that can be used multiple times in a turn (ex: Ezuri, Renegade Leader). There are more varieties than this but this gives you a head start at least. Taking down their life total isn't the only way to win the game. Getting rid of their library does the trick as well. Thanks to Scars of Mirrodin, poison is back. If your opponent has ten or more poison counters then they've lost. Some cards just flat out let you win the game or force your opponent to lose immediately. Some examples: Felidar Sovereign, Helix Pinnacle, Laboratory Maniac, Near-death Experience, Mayael's Aria, Door to Nothingness, and Darksteel Reactor. Infinite combos and instant-win combos don't care what the life total happens to be at any given time. For example, the casual favorite: Beacon of Immortality + False Cure. This isn't always the case for every Planeswalker but most have an ultimate (their final ability) that can pretty much end a game regardless of life total or other factors. Some won't end the game but they'll put a stop to any shenanigans such as Karn Liberated who resets the game in your favor. This is Kylak signing out and hoping you gain an advantage over their life gain.